The fact is, engagement all across Instagram has dipped over the last 6 months. Some Instagram marketing circles blame the recent IG algorithm update for it. The new update favors Instagram posts with the highest engagement cues such as comments and likes. The more likes and comments you have on your post, the higher your chances of showing up on many more people’s feeds. It’s more important than ever not to make your posts appear “spammy” to avoid a shadowban from Instagram. And posting several times a day or using more than 10 hashtags in a day might get you punished too. You are likely to engage a crowd if you are playing their favorite tune. People cherish belonging to like-minded communities. And your Instagram followers are likely to like, comment and share when you post stories, images, graphics quotes, videos, etc. that relate to their specific interests. For example, to receive likes and comments on your fashion posts, you’ll need your post to appear in a community of fashion lovers. You can even go as deep as targeting a particular kind of fashion sub-niche such as ladies’ handbags or designer jeans and build a community around that. Liked Lab’s Instagram Follower program is the perfect solution for finding the highest quality audience, the people that are already primed to become your followers. And a tool such as Iconosquare can help you find out what your IG audience likes and comments on the most, so you can understand what your audience wants to see. You are aware that explicitly telling your Instagram followers to like, comment or share your post after they have read it helps boost engagement. But directly asking for likes can feel manipulative. Like it’s all you care about, anyway. Instead of asking followers to like or comment on your post, ask questions. Engagement is all about getting your followers talking. Share a thought about something you are currently doing or planning to do and ask for your followers’ opinions. That is more authentic and makes your tribe feel their opinion is valued. The right time to engage your Instagram followers is when they are most active online. Again, you can use an Instagram analytics tool such as Iconosquare to see when your audience is most active, and where they click on most when active. You’ll see a trend that shows you when to post and use quality Instagram hashtags to boost engagement by up to 12.3%. Quality and relevant content posted consistently at the most active time will help you reach more people within a short time. Note the new Instagram algorithm gives higher preference to posts that get engagement cues fast and seem to be trending. You can even appear on the trending posts page this way and get even more followers and engagement. Instagram live videos encourage real-time engagement. You’ll want to alert your followers before going live, of course. So go ahead and post a message informing them about what time to tune in to your live video session. Tell them how the live session caters to their interests. Keep providing resourceful tips via live video at a consistent time and you won’t even have to mind much about when your audience is most active. You’ll have taught them to expect your session at a specific time. A long-term Instagram engagement technique that works. Hosting a contest on Instagram is a great way to increase both engagement and new followers. But have you ever wondered how to use reviews on Instagram? The point here is to utilize user-generated content to, again, demonstrate you value your audience’s opinion and individual insights. You can team up with another brand, for example, a brunch restaurant in town. Have a gift for participants that like and post the best comment on a specific question you ask. Post a challenge. Ask why they deserve a free mid-morning dish at your partner’s restaurant. The best comment gets a brunch treat for two. Importantly, after you have awarded the best participants, follow up by asking them to share their experience with your audience. Again, you want this to go live when your audience is most active. This and the other Instagram engagement techniques discussed here not only get you new IG followers but persuade them to keep returning to your account. They’ll not want to miss anything from you. That is exactly what you want, right? 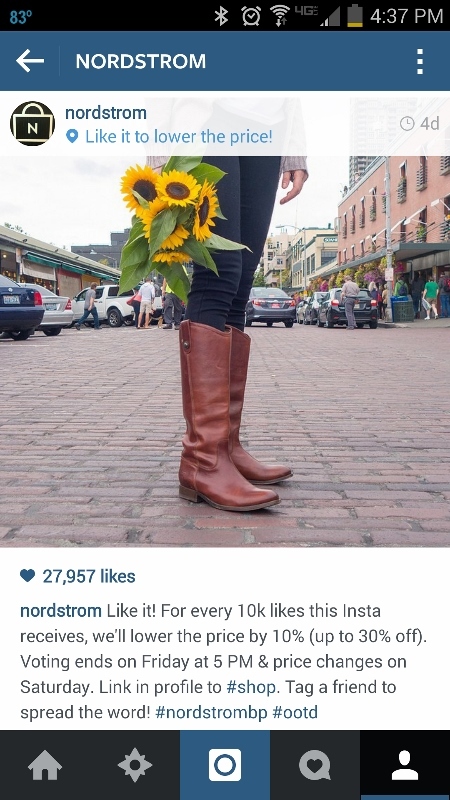 What Instagram engagement strategy has worked for you?